Are you doing content marketing... or just creating content? 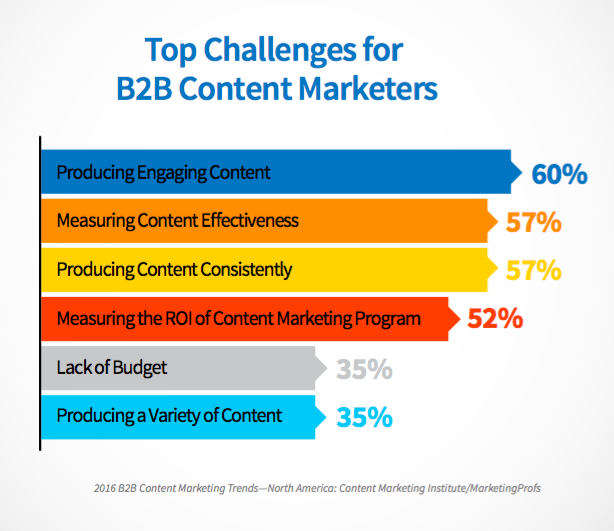 Are you doing content marketing… or are you creating content for content’s sake? Are you in the content marketing business, or are you in the content creation business? Is there a difference? Great question asked by Mark Schaefer who made me want to elaborate because it definitely needs clarification. The keyword that’s missing from many of these how-to guides is: ROI. 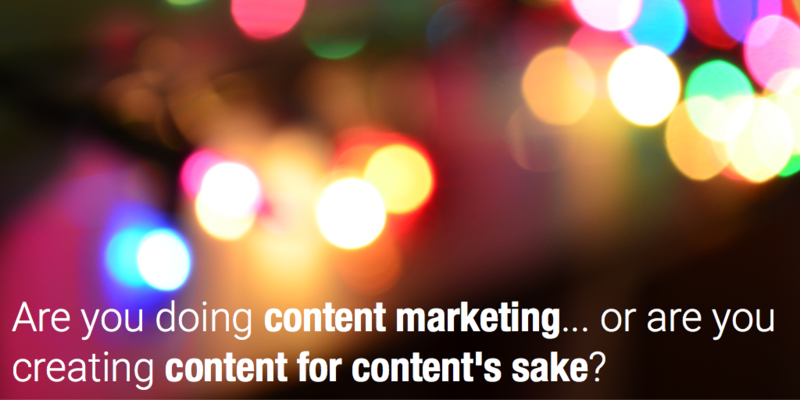 Content for content’s sake is not content marketing. Content marketing is the practice of publishing and distributing content that answers your prospects’ questions in order to guide them towards considering, purchasing and be satisfied with your product. You can see that this definition is definitely a marketing one. It’s not about being salesy or interrupting with ads – but it’s not about being a 100% artistic practice nor even a media one. Because marketers are not historically trained to create content, a number of companies have recruited writers, journalists or media people. I’ve done this as well and it didn’t work out: not because these people are not good – quite the opposite – but the marketing objectives you describe (creating demand) are not hard coded in their DNA. I was discussing that with a client the other day who has a journalist background and is now a content marketer. He’s now great at what he does – content marketing not content creation – but he admits he took him a while to adapt. Back when he was a writer, he was measured on page views because the media company that employed him made money out of advertising. He now works for a B2B software company and had to re-invent himself, adapt to a culture of demand generation and other performance metrics such as lead generation. 2. Content marketing is a cycle: producing content is just one of the steps. The #1 hurdle for most marketers when starting out with content marketing is a lack of good content. We started ourselves by focusing on solving that particular problem (through content curation) before also working on adding value planning, distributing content and content ROI analytics with Scoop.it Content Director – our full-stack content marketing software. The chart above from last year’s CMI / MarketingProfs yearly benchmark shows measuring content effectiveness raised to #2 for the first time. Content marketing is a cycle: strategize, plan, produce, promote, analyze. Repeat. Content marketing is an ongoing cycle that requires optimization at every stage in order to succeed. But when you’re just getting started, you only see your own lack of content and tend to focus on solving only the production problem. A lot of marketers don’t realize upfront they’ll also need to address distribution problems – if only because organic reach is declining on social networks – as well as use proper analytics to measure ROI. Finally, the daunting ROI question. Isn’t it more comfortable to be measured on a subjective notion of content quality than on the number of leads you generated last week for your sales team? I’m not saying that to point fingers: I totally understand and sympathize. And so I make it our mission to change that and make content marketing more predictable. We’ve been through that before: selling used to be called an art when I started to work 20 years ago. Great salespeople were Jedis who used psychological tricks to close deals. And to some extent, it still is an art. But sales methodologies have proven their value and good VP of Sales implement them with undisputed success. Similarly, content marketing won’t ever be an exact science. But I believe a lot can be done to promote proven, ROI-generating best practices. To help take the guesswork out of your content marketing, we’ve created a content marketing analytics framework for you to use that tells you the exact KPIs to use to measure ROI. So if you’re not sure whether you’re doing content for content’s sake or if your content is really effective to reach your marketing goals, let us know in the comments or reach out to us: we’d be happy to talk and understand better how we can help.